If you're tired of typical polish and want something a little different, you might wish to try color change nail polish. This polish literally changes to a new shade based on when you expose your nails to sunlight or heat. That being said, make sure you like both of the shades before you apply the polish or you could be in for an unwelcome surprise when you get outdoors. The color change is not permanent. Once you cool off or move out of the sun, the polish reverts to its original hue. This means you can make the color change over and over again. 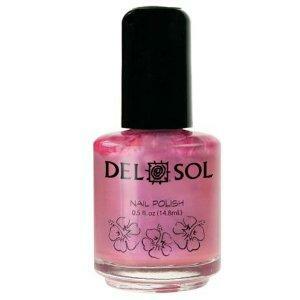 One of the leading brands of color change nail polish is Del Sol, which means "of the sun." This company, which markets to kids, makes all kinds of color change products, from flying discs to t-shirts to stuffed toys. You can often find their stores in beachy tourist areas. There is no set pattern as to how the colors change on their 24 shades of polishes. Some get darker, some get brighter and some change almost completely. For example the color "Reckless" changes from a white to bubble gum pink and "Island Fever" goes from a shimmery green to an iridescent cerulean blue. Another brand you're likely to see a lot of is Nubar Moodies. These polishes, marketed as changing color according to your mood, actually change based on the temperature they are exposed to, either internally or externally. All Moodies polishes do not contain toluene or DBP. They come in a full line of colors, from yellows and greens to pinks and browns. Most change to similar colors, but there are some dramatic color shifts, such as from lemon yellow to white or from bright red to bright orange. A third option is Scherer Chameleon polish. It doesn't change color in the traditional sense. Instead, it appears to be a different color depending on the angle you look at it from. Again it uses light to change, since it reflects of the polish differently. While it used to sell at Rite Aid, this polish is no longer available in stores. You can find bottles of it on eBay and other auctions sites, though. This is not an exhaustive list of brands. There are others available as well. You don't have to be a kid to like color change nail polish, but youngsters certainly enjoy it. For these reason, you're likely to find it at stores that cater to children and teens, such as Claire's and Five Below. You may even see a few bottles in the juvenile makeup section of your local toy store. Mega beauty outlets are also a good place to try. Two common ones are Ulta and Sephora. Don't bother heading to a typical salon or department store. These places are not likely to have it in stock. Note that, in general, color change polish is more expensive than regular nail polish of comparable quality. Children using this polish should be supervised to ensure they do not ingest it or spill it on their clothing or household items.